MARIETTA, Ga. — Big men on campus lay prone in deep repose on portable tables, oblivious to the 46-degree chill, as pairs of hands dug into their vertebrae. At Life University College of Chiropractic, when they say they’ve got your back, they mean it. 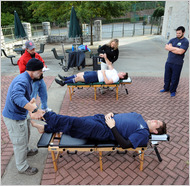 An hour before game time against the Atlanta Old White club this fall, adjustments were being provided to burly Life rugby players, most of them current or future chiropractors. Nestled on 89 acres in this suburban city, the campus is the nation’s largest springboard to the field and, not by coincidence, home to the most elite rugby squad connected to an academic institution. For chiropractic practitioners and prospects, Life could not be better, with two teams of 50 ruggers and a third on the way. Although rugby proponents may reject the label of most dangerous sport, players’ out-of-whack spines afford an assembly line of bodies to press on. “They get pretty beat up,” Life’s president, Dr. Guy Riekeman, said. Little could Life’s founder, Sid Williams, have envisioned the promotional benefits when he approved the sport three decades ago at the urging of two rugby-loving students. Williams preferred football, having excelled at defensive end for Georgia Tech, but beginning a program was judged too costly. In hindsight, the pioneers can pat themselves on their realigned backs. Who could have known then that rugby and chiropractic would become so intertwined that a marketing tool would evolve? Or that everlasting bonds would form, attaching former Life ruggers to the university and to one another with a devotion rarely seen in sports? They coach rugby in high schools. From the sideline or while hunched over aching patients in their offices, they direct young men, and women, to Life, especially those with an interest in rugby. They bought the team bus, valued at $65,000, and paid for the athletes’ weight room. When budget limitations would have kept 13 nonessential players home from a championship event in May, the alumni financed their trip to Colorado. “You get bitten by the rugby bug, you fall in love with it and you get close to the players” past and present, said David Eugster, class of 1983, the alumni association’s president. The chiropractic college, by far the largest of three schools at Life, lost its accreditation in 2001 in a dispute over teaching philosophy, jeopardizing the university’s existence. Enrollment plummeted to 500, from 3,500, forcing cuts in spending. Rugby was “very, very close” to expiring, Eugster said. The old guard stepped forward, checkbooks in hand, and helped rugby stay afloat until the college was restored to good academic graces. The superior of the two Life squads, consisting largely of graduate students, belongs to the 16-member, invitation-only Super League. It’s the top shelf of American rugby, and Life, which has won one championship in the Super League since its inception in 1996, was runner-up last spring. Both versions of Life’s Running Eagles compete on the more competitive club level, not against teams at universities. The arrangement allows for some upper-crust ruggers who have completed their studies to continue to play for the team. Brendan Thompson is among the fortunate few on full scholarship. A native of Perth, Australia, he was painting houses in Chicago and engaging in scrums on weekends when he heard about Life. “I didn’t know much about chiropractic,” Thompson said. “Had never seen one before.” Now he intends to be a chiropractor. His teammate Kris Headley seems less certain of his career path. Discovered in Montana by a former Life rugby player, Headley, a construction worker and player for the Missoula All-Maggots (slogan: “A Maggot Squirms Through It”), concedes to “not knowing much” about the profession. He is just happy to be a Running Eagle. “It’s like a brotherhood,” he said. Attention is sure to heighten now that rugby — the seven-on-seven version, not the standard 15 players per side — has been welcomed to the Olympics, starting in 2016. Also, a third team from Life will compete next season, this one at the college level. Rugby generates no direct income here. Spectators who alight on the five rows of metal bleachers are admitted free. The stadium — with crooked goal posts, a postage-stamp-size scoreboard and clock, and a tent as the visitors’ dressing room — would have to upgrade to qualify as no-frills. In years past, tables were lined up along the field, with chiropractors giving alignments free to fans and opposing players. Insurance concerns ended the perk. Gary Lambert, class of 1988, a onetime United States national team captain, wound up at Life after he claimed an adjustment “literally saved my life” and altered his career ambition. Suffering from a neck injury, numbness and headaches in the early 1980s, Lambert was weighing surgery when his national team roommate mentioned he was a chiropractor. Lambert had no idea what a chiropractor did, then became such a believer that he soon found himself in a registration line at Life. Someone recognized Lambert, who was wearing a rugby shirt. He was pulled out of the line and by day’s end was a Running Eagle on scholarship. A generation later, his son followed. Their fellow alumnus Eugster attributes the fraternal nature of ruggers partly to “the physicality,” a polite way of saying how rough it is. A seven-year study of an Australian professional squad concluded that a match causes an average of 1.4 serious injuries, twice the rate of football. The national insurance provider of New Zealand, where rugby is the national sport, ranks rugby playing as its most dangerous occupation, ahead of horse racing and logging. The Running Eagles went out and won, 28-16. Like most of their matches, it was no spine-tingler.